Staying in on weekends at Charterhouse can be somewhat dull when the weekend activities aren’t sparking your interest. There is a variety of activities at your disposition in our lovely town at only 10 minutes away from school. 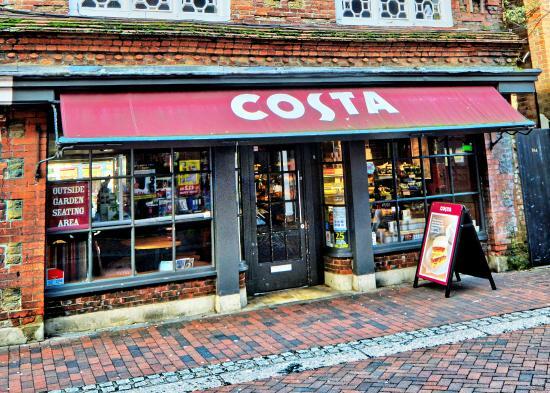 Located in the heart of the high street, costa is a quiet spot to meet some friends and have a warm drink and a snack. The warm atmosphere and welcoming staff make this spot a favourite amongst Charterhouse student. The museum covers the local history of Godalming and the surrounding area in Surrey. The collections include paintings, ceramics, embroidery and architectural designs. This is a more culturally enriching experience for the more curious and academic Carthusians. The most popular destination for all Carthusians (delivery and eat in), Domino’s never fails to satisfy after a long week of work and sports. Although it isn’t optimally located, they offer a quiet and cosy atmosphere for their customers. Owned by the natural trust, this serene location offers an optimal place for a moment of quiet reflection in nature. No matter what the season, the colours of this garden never fail to impress, and it offers a chance to escape the movement and stress of the daily Charterhouse life. Next Post Are We Heading towards a Recession?